"Todd's novels are known for compelling plotting with a thoughtful whodunit aspect, rich characterization, evocative prose, and haunting atmosphere." "Readers who can't get enough of [Jacqueline Winspear's] Maisie Dobbs...are bound to be caught up in the adventures of Bess Crawford." To great critical acclaim, author Charles Todd introduced protagonist Bess Crawford in A Duty to the Dead. The dedicated World War I nurse returns in An Impartial Witness, and finds herself in grave peril when a moral obligation makes her the inadvertent target of a killer. 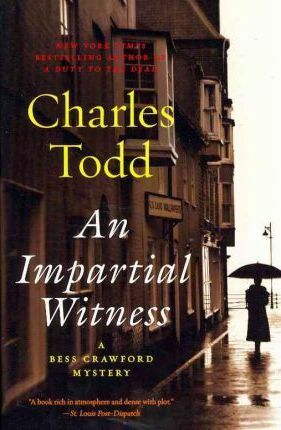 As hauntingly evocative as Todd's award-winning, New York Times bestselling Ian Rutledge novels, An Impartial Witness transports readers to a dark time of war and involves us in murder, intrigue, and the fascinating affairs of a truly unforgettable cast of characters. In the early summer of 1917, Bess Crawford is charged with escorting a convoy of severely wounded soldiers from the trenches of France to England. Among them is a young pilot, burned beyond recognition, who carries a photograph of his wife pinned to his tunic. But later, in a crowded railway station, Bess sees the same woman bidding a heart-wrenching farewell to a departing officer, clearly not her husband. Back on duty in France, Bess is shocked to discover the wife's photograph in a newspaper accompanying a plea from Scotland Yard for information about her murder, which took place on the very day Bess witnessed that anguished farewell. Granted leave to speak with the authorities, Bess very quickly finds herself entangled in a case of secrets and deadly betrayal in which another life hangs in the balance, and her search for the truth could expose her to far graver dangers than those she faces on the battlefield.